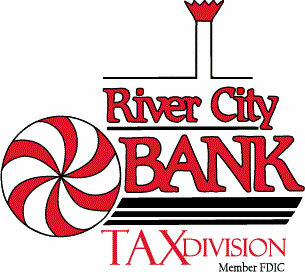 River City Bank for Tax Year 2018. River City Bank's long-standing reputation in the bank product industry spans over three decades with a focus on commitment to excellence and customer service. Our priorities are simple; to provide valuable and cost-effective products and services that EROs and taxpayers need while maintaining a high level of integrity to help protect the future of the industry. River City Bank remains driven to be the absolute best choice for your most successful banking partnership. River City Bank is excited to offer these excellent pricing tier options for the 2018 Tax Year. You have the Freedom to Choose which option is best for your business. With all disbursement options, all preparation fees will be deducted from the taxpayer refund and paid daily to the ERO by direct deposit. Electronic Refund Check (ERC) – When funds are received from the IRS or state treasury, you will print a check for the customer in your office on bank-provided check stock. River City has arrangements with Walmart and many other retail and grocery chains across the country to provide easy and affordable check cashing. Refund Electronic Transfer (RET) – Customers with an existing bank account can have their funds deposited to their personal savings or checking account instead of returning to your office to pick up a check. Prepaid Debit Card – The taxpayer leaves your office with their card and receives a text message when their funds are available, eliminating the hassle of returning to your office to pick up a check. Walmart Direct2Cash – Direct2Cash allows customers to receive their refund in cash at Walmarts across the country. A Reference Code is emailed to the customer when funds are available and is taken to a Walmart MoneyCenter or Customer Service Desk along with their photo ID to collect their proceeds in cash. Walmart charges a $5.30 fee for this service which is deducted from the customer's refund prior to disbursement. Fee Forward — For tax year 2018, EROs will once again be faced with refund delays imposed by the PATH Act. Don't be overwhelmed by financial burdens in January and February when expenses are high and income is low. River City Bank's Fee Forward program can ease those burdens with daily direct deposit advances of a portion of the ERO's anticipated preparation fees. Free Marketing Resources — Professionally created English and Spanish banners, window clings and posters are just a few of the marketing tools River City Bank provides at no cost to the ERO. Customer retention marketing is also available at no cost. Most importantly, ordering is made easy with our online ERO portal. Free Taxpayer Text Messaging — River City Bank will notify the taxpayer with an automatic text message as soon as their check has been printed. No more persistent and time-consuming phone calls. When a customer's check is ready, we'll let them know. For more information, email csr@rcbtaxdivision.com or call (888) 820-7848 or visit us at www.rcbtaxdivision.com.